Teaching Childhood Basics with Imaginative Toys + Homemade Ice Cream in a Bag Recipe! Do you have a little one headed to preschool or kindergarten next fall? It is their last summer before they enter a lifetime of schooling, and it might also mean you are frantically playing catch up on some of those basic skills they need for school. Instead of bombarding them with flashcards and boring activities, let them play and learn! We are working on the basic math and reading skills my son will need for preschool, and I love to create educational games centered around his toys so he learns without even realizing it. 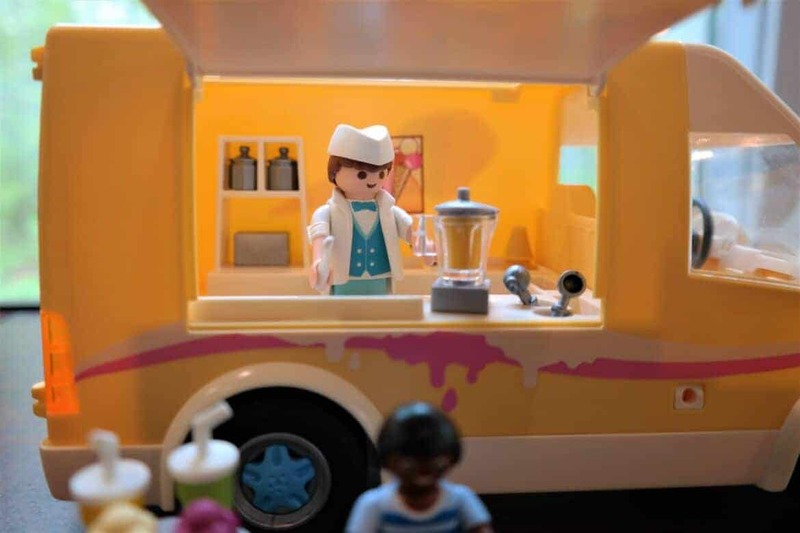 When I had the chance to review the new Playmobil® Ice Cream Truck, I knew I had found the perfect toy for summer. As a kid that loves anything with wheels, my son was even happier because his new toy was associated with his favorite treat. It also provided me with the chance to teach him a variety of new concepts basically using toys and ice cream. What kid wouldn’t love to learn this way? 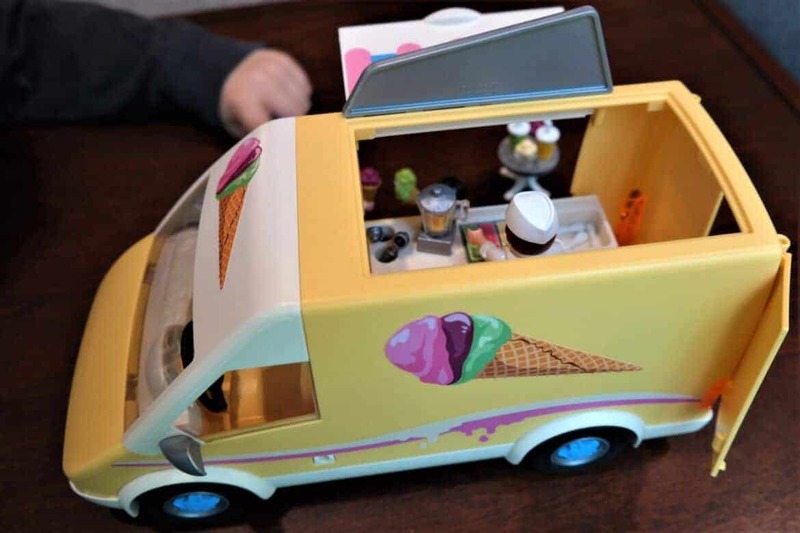 Recommended for ages four and up, the Ice Cream Truck comes with a variety of accessories to inspire your little one’s imagination. The truck has a driver that serves up the ice cream from the back where the side opens for a serving window. The top also comes off for easy access to the inside and all of its items. It is stocked with a blender, ice cream cones, ice cream sundaes, drinks, ice cream scoops and spoons! It even comes with a table and two friends eager to have their own ice cream cones. 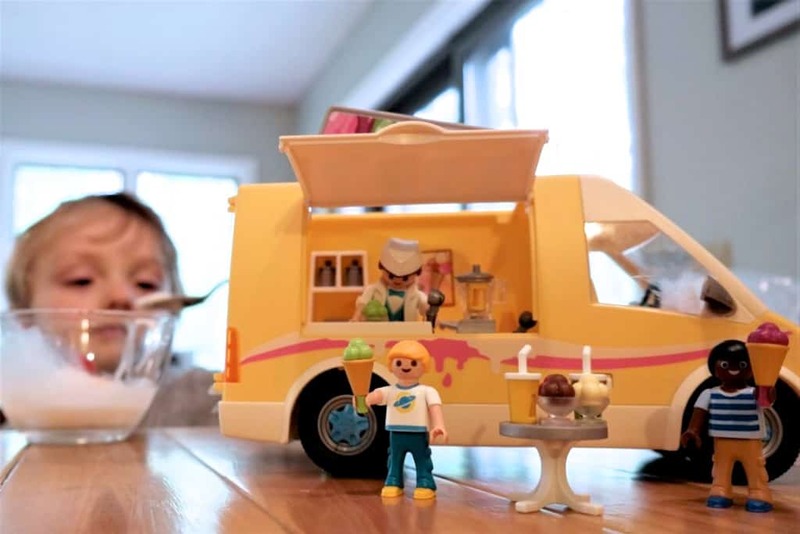 Here are a few of the things we practiced learning with his new ice cream truck. My son understands the basic idea of money. He knows we have to “pay” for the things we get at the store, but with his new ice cream truck, it gave me the chance to pull out the change jar and explain what “paying” means. 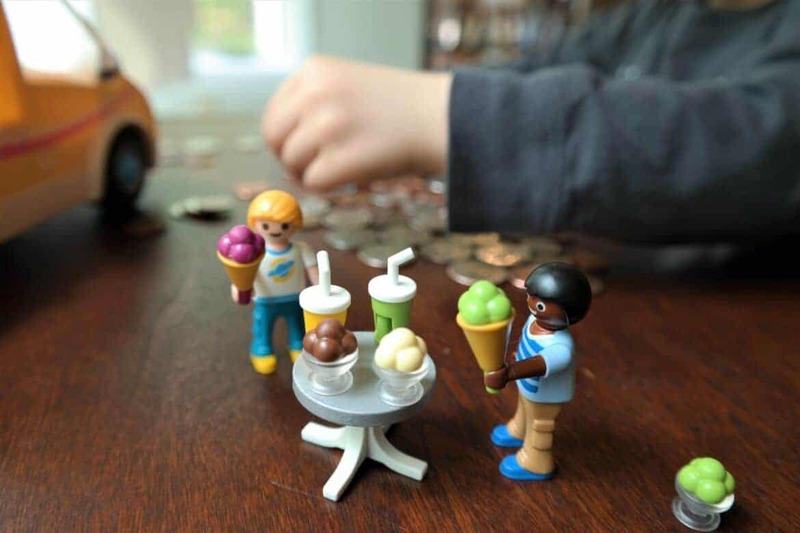 We practice learning the names of each coin and handing over the right denomination for an ice cream cone, switching up the amount depending on the toppings he pretends to order. I have found it easier to teach manners if I act out politeness using my son’s favorite toys. Just peppering please and thank you into play has made him pick up on the habit. When we play with his ice cream truck, I make sure to slip in the politeness, and he doesn’t even realize I am teaching him his manners. I might also discuss the importance of picking up toys and how much fun washing dishes is just to see if I can get him to help clean from time to time. It can’t hurt. No ice cream truck would be complete without actual ice cream! To make it more engaging, I decided to make some right at home with a method perfect for little ones. You mix ingredients and let them shake it up in a bag of ice until you have your own homemade version of ice cream. We practiced math as we measured out ingredients then put them in a sealable bag. I taught him a little science when we mixed the ingredients inside another sealable bag with ice (and salt to lower the freezing temperature of the water) and did my best to explain why it freezes into ice cream. We shook up the ingredients and ice until we had our own ice cream. For a very active little boy, this was a engaging way to teach him new ideas and concepts without having to sit still. Plus, it did tire him out a little, at least until he ate the ice cream. Below is the recipe from Tablespoon if you want to give it a try! Mix the half & half with the sugar and vanilla in a resealable bag. In a larger resealable bag, put the ice and salt in and insert the smaller bag. Shake it up! In about twenty minutes it will become thicker and the consistency of ice cream. Add your own toppings and enjoy! Use every opportunity as a chance to learn something new. 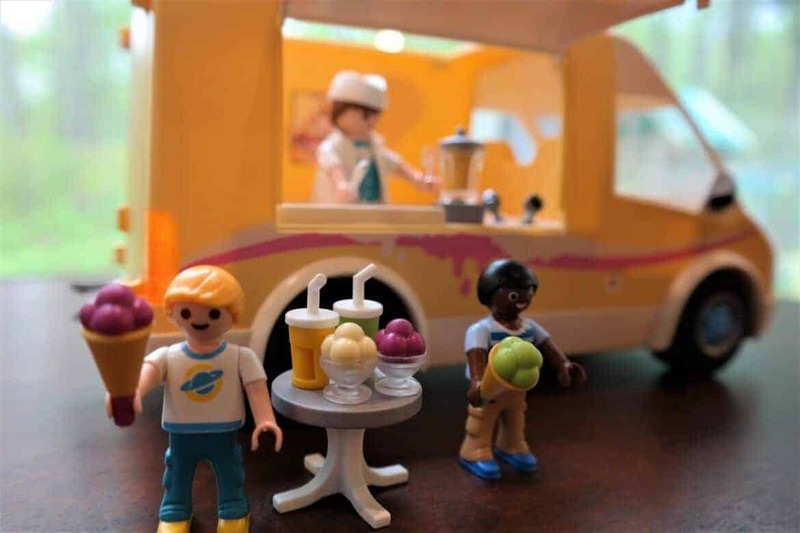 With the Playmobil® Ice Cream Truck, it is a fun summer toy that you can give your little ones and help prepare them for their first years of school without overwhelming them. So my little dude would go nuts for this toy. What a fun idea and way to play! What a cute little play and educational centre, cor an toddler :) Great gift idea! That is so cute, and the perfect teaching tool. I think my little nephew would love this and I might get it for him. I owe him a belated birthday present anyhow. This is so cute! Love the idea of teaching children through fun play. My nephew is turning 4 and would get this for his birthday. I think this is really nice! It’s good to have a toy that will allow you to teach kids while they also have fun playing!